NB. To download the other films in the bundle click the links below, after it says "Includes 12 videos:" OR hit the 'Hot Aches Productions' link at the bottom of the page. Redemption: The James Pearson Story tells the controversial story of one of the World's best trad climbers, Englandʼs James Pearson. After a dramatic rise to become one of the top climbers in the UK, controversy surrounding the grading of his routes left him feeling ostracised from the climbing scene. 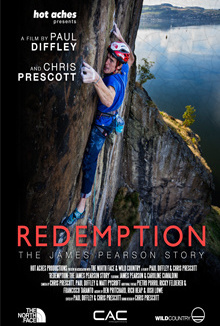 The film tells James’ story and follows his return to the UK as he faces his demons and looks to redeem his place within the UK climbing community. All Hot Aches Films to date for $45!